So what's so great about the Great Pyramid? Lots of stuff, like its amazing shape and dimensions. Click on the pyramid to find out more. 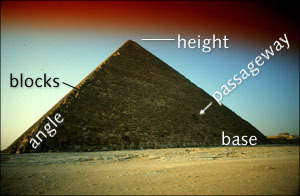 Build a scale model of the Great Pyramid and compare it to scale models of other objects you know.